Poland Is Europe’s Growth Champion. Can This Continue? Key elements of the Polish success story resemble that of the German post-war economic story, especially relying on social and economic inclusiveness as a driver of economic success. Poland is the fastest-growing large economy in the world among large countries at a similar level of development. Key elements of the Polish success story resemble that of the German post-war economic story, especially social and economic inclusiveness as a key driver of economic success. The key risk to Poland’s future is the weakening of the European Union. Without the EU, Poland would revert back to the dark periods of its history. Poland was a perfect illustration of an extractive society. It was WW2 and the shock of communism that demolished the old structures and opened up society. Polish society must remain inclusive. This is something that the current government, despite triggering domestic strife in other regards, has performed well on. What about the roots of Poland’s success? Do they offer lessons for its neighbors? And what must Poland do to continue its progress in the coming decades? Little wonder then that Poland this year became the first post-communist country to join the FTSE Russell list of developed countries. This success has occurred despite Poland having no natural resources. It is also based on real growth, as the country has managed to keep public and private debt levels low. Better yet, economic growth has been such that it is truly a tide that has been lifting all boats. For the first time in Poland’s history, its economy is supported by an inclusive, egalitarian, well-educated and socially mobile society, which has allowed the whole population to flourish. Indeed, Poland has been the only post-communist economy where incomes for the whole of society have grown faster than the G-7 average. Unlike most other fast-growing economies around the world, Poland has achieved its remarkable catch-up with the West while being robustly democratic. This robustness is underscored by the fact that Poland has had 17 different governments from the left, right and center since the start of the transition in 1990. But how did this thousand-year long economic laggard manage to step up and become Europe’s growth champion? 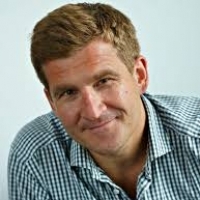 What drove good economic policies? 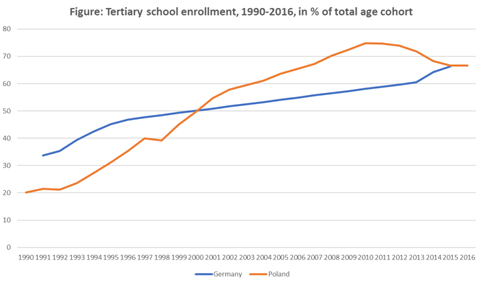 If the policies of the Warsaw Consensus were implemented, Poland ought to be able to grow at more than 3% per year and catch up with the West within the life of the next generation. Then, Poland’s miracle can continue. For that to happen, Polish society must remain inclusive. This is something that the current government, despite triggering domestic strife in other regards, has performed well on. For example, it has introduced a child cash transfer scheme that has almost eliminated extreme poverty. It also increased the minimum wage and made taxes more progressive. 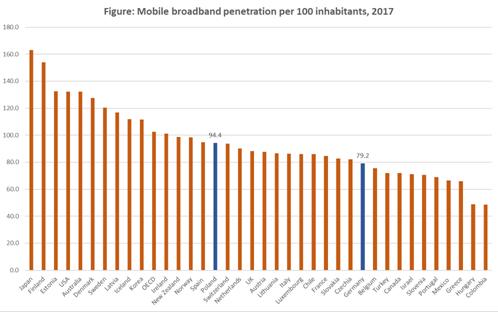 The risks to Poland’s continued success are well-known: Population aging, demographic decline, low level of innovation and low investment. 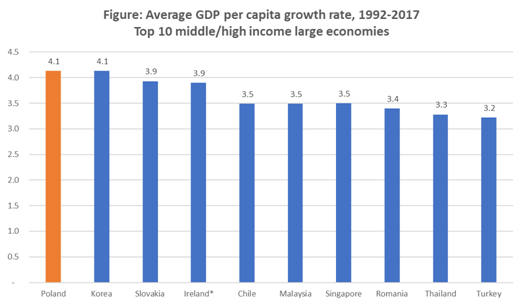 Editor’s Note: This essay draws on “Europe’s Growth Champion. 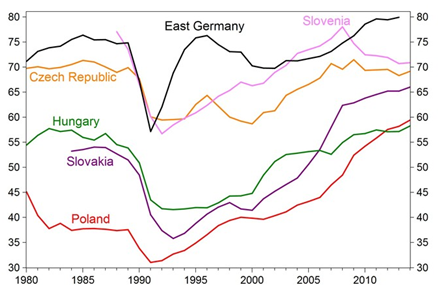 Insights from the Economic Rise of Poland,” Oxford University Press, 2018. Source: Author’s own based on the World Bank’s WDI database. Note: PISA test score represents average from mathematics, science, and reading. 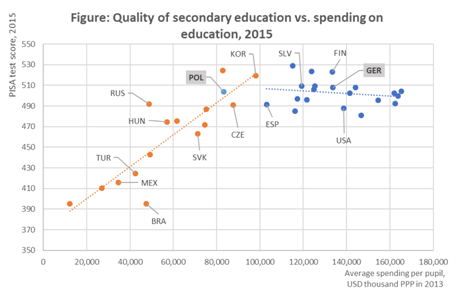 Source: author’s own based on the OECD PISA database. Note: Missing data for Germany during 1998-2012 assumed to follow a trend. Source: Author’s own based on the OECD database.